After spending a day in Adelaide, we woke up early the next day and dragged our luggage from our backpacker to the Adelaide Central Bus Station. We definitely needed to learn how to pack light! From the bus station, we took a bus that would take us to Cape Jervis. Cape Jervis was about 2 hours away on the bus and was on the south of Fleurieu (pronounced floo-ree-oh) Peninsula. From there, we took the Kangaroo Island SeaLink - a ferry going from Cape Jervis to Penneshaw, Kangaroo Island. 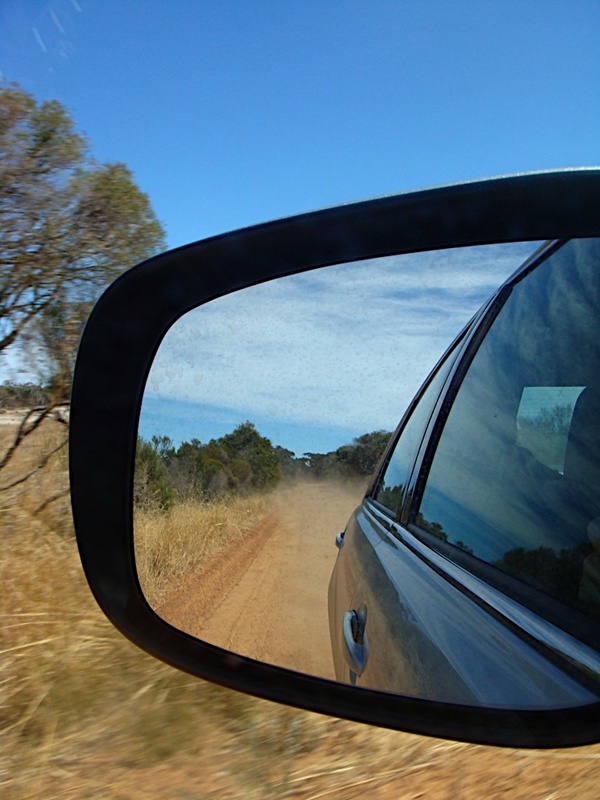 As Kangaroo Island is a huge island with no public transport, we decided to rent a car for the three days that we would be there. The map of the island was relatively simple. There were not that many roads around the island - only a few (maybe, three?) main roads that are sealed, and most were gravel roads or unsealed roads. Once we got our car, we decided to start off our trip with a visit to a lighthouse situated at the southeast end of the island. And even with the simple map, we ended up driving on an unsealed road, before finding our way back to the relatively better gravel road. We reached Cape Willoughby Lightstation just in time for the morning tour. We bought the Kangaroo Island Pass that provided us with entry and tours to the major attractions around the island. The tour guide, who I believed was the national park ranger, brought us around the lightstation. 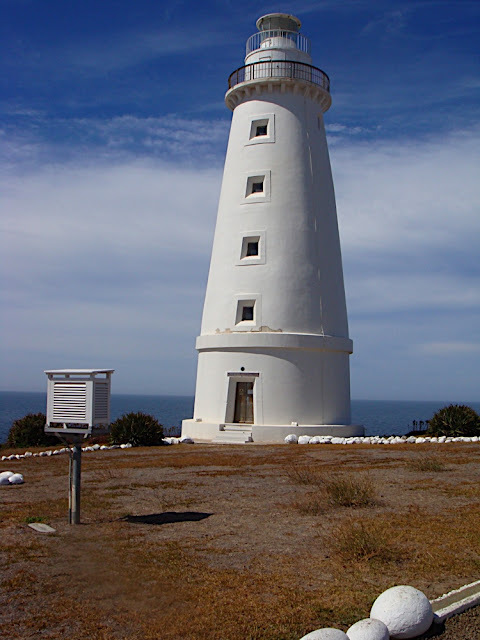 We learnt that Cape Willoughby Lightstation first operated in 1852, and was the first lighthouse in South Australia. Today, it is used as a weather station. We also had a quick lesson on how a lighthouse, or a lightstation in this case, works. Oil was used during those days, but the technology was on the lenses. 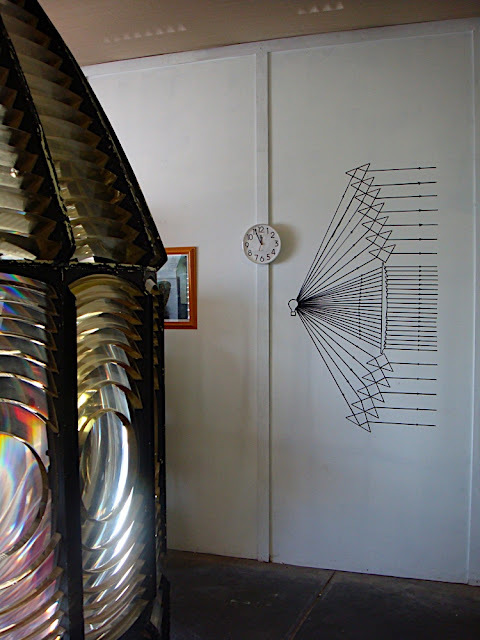 As shown in the diagram drawn on the wall, the lens would spread out the lights. I shall not explain much further, as you would definitely be better off reading it elsewhere! But, this I learnt - all lighthouses had special light pattern or characteristics that would allow sailors to know which lighthouse they were near to, and so the position they were in. Of course, these days, all they need is a GPS. During those days, the lighthouse keepers would also use flags to signal and communicate with the ships and sailors. After all the history and lessons on the lighthouse, it was time to climb up the stairs to see the light on top. However, we were more interested in the view and scenery from the top! After the educational tour, and without realising that this would just be one of the many lighthouses we would be seeing in Kangaroo Island, we continued to explore the island. We drove off Penneshaw, searching for the Clifford's Honey Farm. It was, unfortunately, pretty small and there weren't any tours to look at bees making honey. The bees, we learnt, were Ligurian bees. They were the only pure strain of Ligurian bees in the world. This basically meant that someone brought some Ligurian bees into the island and the bees had remained isolated in the island as they couldn't fly to the Australia's "mainland", and so they were not mixed with any other bees. We bought some honey, honey body lotion and had some honey ice-cream. Right next to the honey farm (or so it felt because everything else were so far away from one another), was the Emu Ridge Eucalyptus Distillery. The shop sold lots of eucalyptus oil product, which we ended buying only some eucalyptus sweets. Truthfully, I wasn't a big fan of the smell. The owner of the distillery was also a carer for orphaned animals. There was a young joey with a broken jaw in the shop as well as emus out in the garden. It was really great seeing how these animals were being taken care off. We made our way back to Penneshaw after that as we planned to take a penguin tour at night. As we still had some time to spare, we stopped at one of the beaches along the way (couldn't remember the name!) and spent some time admiring the sparkling sea. On our way, we saw a house being moved - literally! The person who thought of this ingenious way of moving house must have simply hated packing and unpacking! We had lunch at a cafe on North Terrace, called simply as the Fish Cafe. They serve fish and chips, with different choices of fish and method of cooking. It was quite good, although the price for such a simple dish was quite high. Finally it was time for the tour at the Penneshaw Penguin Centre. I was pretty excited just thinking about seeing the little "fairy" penguins walking around... however, I was extremely disappointed as we only managed to see a handful of the penguins hiding around the bushes in the dark! It was definitely not what I have imagined it to be, but it was quite interesting seeing little penguins around the Australian bushes. It kind of destroy the image I had about penguins (think March of the Penguins)! It was quite late at night after the tour and we drove carefully and slowly to Emu Bay where we will spend the night. We saw many kangaroos and wallabies along the way. They were leaping onto the roads without a care! It was quite a stressful drive (even for me who were just sitting in the car)! Finally, we found the Emu Bay Holiday Homes in the dark without much street lights and road signs. It has various good value budget cabins with views over the Emu Bay... will show you some photos in my next post!